'Cool as a cucumber' (idiom) - calm, self-possessed, imperturbable, unruffled. This most definitely does not describe my state with the thermometer now pushing 33C in London and humidity touching 90%. We Brtis are wimps when it comes to heat. Well, at least this Brit is. I'm trying every trick I know not to open the oven or heat up the hotplate. Cooling salads and fruit desserts are all I want right now and I know I'm not alone. Far be it for me to rain on the parade of you super-sunners out there, but I'm from the cold north and I could do with a bit of respite. Until then, I'm making the most of cucumber because actually 'cool as a cucumber' is not just an idiom. Scientists have concluded that cucumber is one of the best things you can eat to cool down in a heatwave, largely thanks to its high water content. So, it's not just that boring *fruit that you slice and use to ease puffy eyes - though at the moment I'm happy to use it that way too. However you choose to use them, UK cucumbers are cropping right now. Early in the season you don't need to peel or salt them to remove excess water content. They're best served cold and crunchy, straight from the fridge - bliss. This recipe is my interpretation of a dish I ate recently at 40 Maltby Street. It makes a great, refreshing and cooling light lunch with little effort expended, and that's exactly what I need. It's not too far from a cucumber raita and could also be served as an accompaniment to spicy meat or fish. Cucumbers originated in the Indian sub-continant where they know a thing about turning down the heat. Add the thinly sliced shallots to the lemon juice and leave to 'cook' for 15 minutes. Thinly slice the cucumbers (peel only if skins are tough). Mix the chopped mint into the yogurt and place spoonfuls onto individual plates. 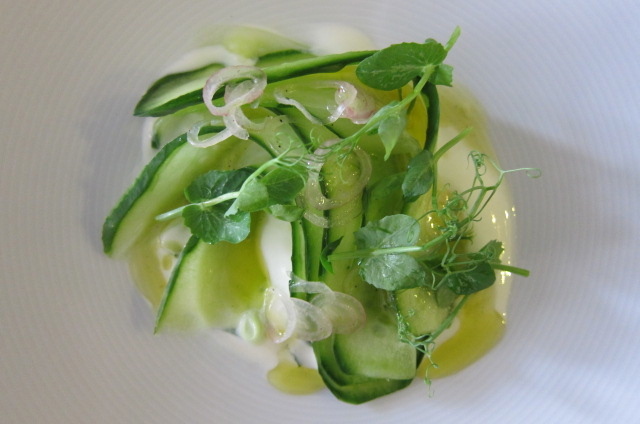 Top with slices of cucumber and the pea shoots, followed by the shallot vinaigrette. Season with salt and pepper. *As it has an enclosed seed and is developed from a flower, botanically cucumber is classified as an 'accessory fruit'.